Think your marketing job is hard? What if you had to push something so oookie that nobody wanted to talk about it? That’s what Michael Paranzino, president of Psoriasis Cure Now has to do, and he decided to have fun with it. Great cause. Great pitch too. 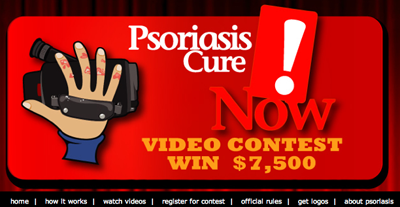 “Don’t laugh, we’re giving away $10,000 to people who come up with the best videos to help educate the public about psoriasis, a serious immune disease that can be debilitating but that gets no respect. The website is live, and the contest officially launches this Wednesday, 7/11. I once tried to get editors to write about plush kidneys that The Kidney Foundation wanted to sell thousands of to raise awareness of kidney disease. And let me tell you, we couldn’t give them away. I hope psoriasis fares better, and I think it will. You definitely called this one, Ochman. Once I clicked through the link, the website lured me in. Since he educated me in two minutes, betcha the campaign will be a showstopper. My father has suffered with psoriasis for years – aggravated by allergies. There were times in past years that he could do virtually nothing with his hands. They were either cracking and bleeding constantly, or he had to wear latex gloves to keep a medical gel on them. Why no cure? Because it isn’t killing anybody. At least nobody important. But it sure as heck was a quality of life issue. I have suffered from psoriasis for nearly 40 years. It got so bad that at times I had over 10 band aids on my hands. I tried every type of lotion and ointment to help control it but nothing worked. Then a friend suggested that I try Mary Kay’s Extra Emollient Night Cream. It does not cure but it stops the symptoms–raw, scaly, rough skin. I have it on my hands, elbows and knees. My hands are back to normal and I no longer need band aids. My knees and elbows no longer bleed. I put it on after I bathe and it lasts all day even though I have my hands in water alot. My hands appear normal. No one would know I had a problem as long as I put it on every day. If I don’t apply it by the second day my skin is reverting back to the bleeding, scaling condition. I know that this sound crazy, but it works. I know that this is not the use that Mary Kay had in mind, but it works. Nothing has worked from what my doctors have prescribed to the over the counter crack creams, lotions or ointments.